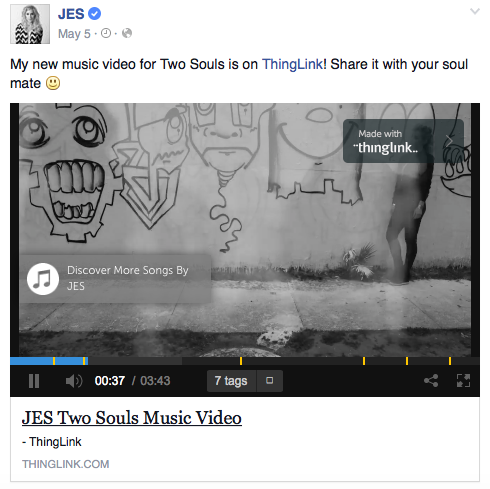 Magik Muzik recording artist JES has debuted ThingLink’s new interactive video format with iTunes Store inside Facebook News Feed. Bands and video producers can now use ThingLink to add music discovery, movie rentals, stores and call to action to the surface of any Facebook, YouTube or Brightcove video. ThingLink offers over 70 unique rich media tags that let viewers browse information from 3rd party websites directly from images and videos. ThingLink’s new iTunes rich media tag includes full album listings and options to preview and buy songs. “As visual media has become our window to the Internet, ThingLink helps online video publishers to deepen their storytelling and drive conversion with tasteful interactive storefronts and discovery options that engage fans,” says founder and CEO Ulla Engeström. ThingLink interactive videos contain clickable rich media tags with several types of call to action options: storefronts, video play, email collection, and surveys. Rich media tags appear for viewers during play giving an option to explore the embedded content while pausing the video in the background. Interactive elements in video multiply viewer engagement, including time spent and and click through rates. Annotating a video with web links is easy. Simply copy and paste links into ThingLink’s editor. ThingLink automatically transforms and displays the web link as a rich media tag. ThingLink also offers tools to customize rich media tags with branding, icons, images, and several font types and colors. ThingLink interactive videos are embeddable in web pages and deliver new, real-time performance metrics from across the web, including video views, tag displays, clicks and actions, time on video, and more.